With the advanced Fastbind Casematic H46 Pro™, you can produce professional tailor-made cases in the format of your choice, in a matter of minutes. Design the cover of your dreams and print it on your digital printer (laser or inkjet). Then, just follow the easy steps on your Casematic H46 Pro to produce the actual case or cover. Fully featured and compact, this table top unit can fit naturally in any environment and cover all short run and on-demand needs. 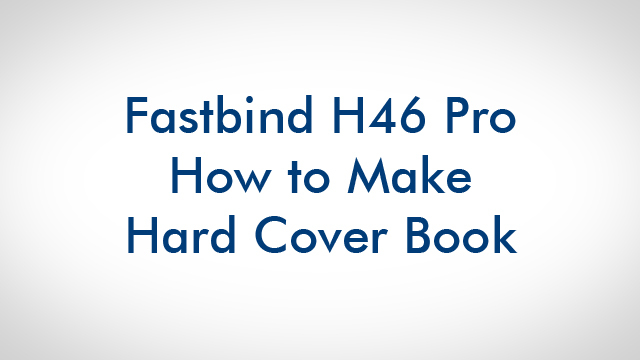 Fastbind Casematic H46 Pro™ is very easy to use. Position your printed cover on the illuminated table; the suction assistance, register marks and centre line ensure accurate placement. Once the boards are attached to the cover, you easily fold the edges on the integrated edge-wrapper. The folding unit is adjustable for different board thicknesses. The applications are virtually unlimited: books and photo book covers, CD, DVD and Blu-ray cases, ring binders,punch binding covers and many more. It is the ideal solution for photographic studios, photo labs and professional photographers as well as digital printers, copy shops and on-demand publishers. The optional corner cutter allows you to cut the four corners precisely each and every time, no mistakes and no training required! The side and back guide makes registration of solid cover material, like material and leathers,easier in an on-demand finishing environment. * An example, max size varies according to spine width.